SPACE STATION NATHAN: Name That Drag--Uh oh! 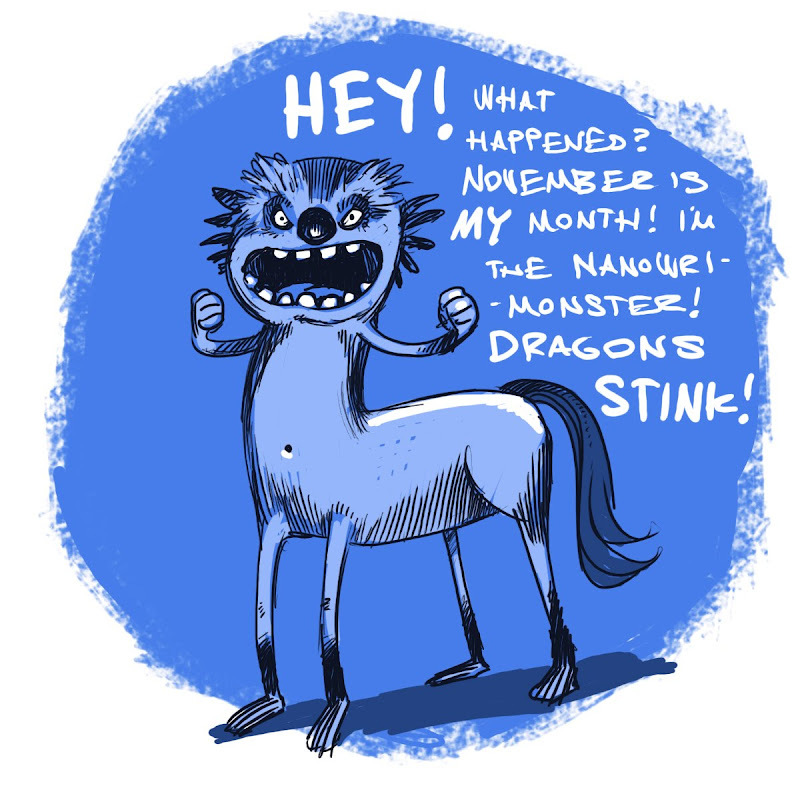 It's the NaNoWriMonster! Wow! I'm surprised it took him this long to show up. It's Chester the NaNoWriMonster! Long-time readers will recognize him from last November when I was doing NaNoWriMo (National Novel Writing Month.) I didn't participate this year, but I plan to next year. I hope everyone who did finished their novel. Here's the update on the book I was writing during last year's NaNoWriMo: Still not finished. I've sold five book contracts since then, three picture books and two graphic novels, but I never got around to finishing those last 50 pages of my NaNo-novel. Thanks to Chester's interruption, it looks like we have one more day of voting. Pick that winning dragon! Vote your pick in yesterday's comment section. Or today's if you feel like it. And to everyone in SLC, tonight is the big holiday author party at The King's English bookstore. It's from 5-7, come say hi, I'll be up to my elbows in BOTS. You are so good at these surprise twists. I never see them coming. Congrats on the book deals. I love the NaNoWriMonster! That's awesome!! !